However, I've made some personal adjustments to suit my own tastes. I omit the almonds and just put in a bit of almond milk. I find the consistency more fluid, and just like having milk in my smoothie as compared to just yogurt and ice. I've also added a bit of peanut butter to it sometimes, just to alternate the taste. 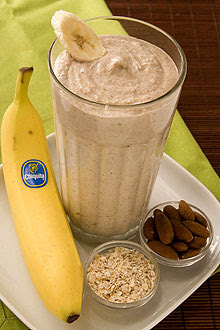 It never really occurred to me before to try cooked oatmeal in my smoothies, but I'm glad I did!